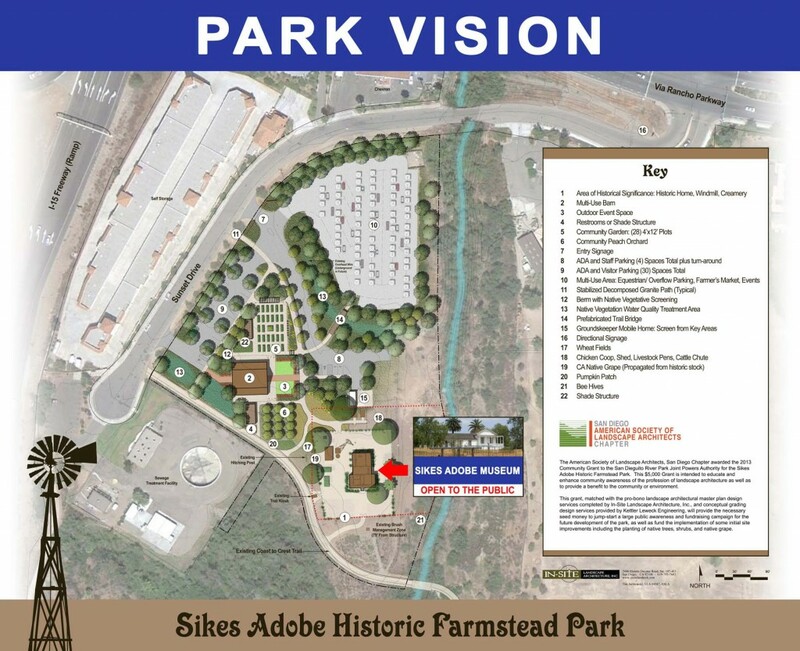 The San Dieguito River Park JPA’s Vision Plan for the Sikes Adobe Historic Farmstead is effectively a target plan for improvements to the site which will add to our ability to meet the goals of our mission and to serve the community. The most prominent features of the Plan include the addition of a barn, with exterior design complementary to the 1880s historic period and the addition of community gardens. The dual goal of providing visitors and site users with a sense of the past and creating a venue in which to hold events is the motivation for the creation of the barn. A structure separate from the historic farmhouse allows for the continued preservation of the historic core of the farmstead. Siting of the barn will be determined primarily by available historic documentation and extrapolation of where the Sikes family would most likely have built their barn. Community gardens, in addition to improved landscaping, shelter for animals, a picnic area, and shade structure will provide an atmosphere more conducive to events of all types to be held at the farmstead. Prior to finalization of the Plan, environmental review and compliance with the California Environmental Quality Act (CEQA) will take place. Click here to see the Park Vision up close, or visit the Sikes Adobe Historic Farmstead, and look for one of our three posted ‘Park Vision’ signs. For questions regarding the status of the Plan, or its features, please email leana@sdrp.org.